Between 8% and 22% of female carriers of DMD mutations exhibit clinical symptoms of variable severity. Development of symptoms in DMD mutation carriers without chromosomal rearrangements has been attributed to skewed X-chromosome inactivation (XCI) favouring predominant expression of the DMD mutant allele. However the prognostic use of XCI analysis is controversial. We aimed to evaluate the correlation between X-chromosome inactivation and development of clinical symptoms in a series of symptomatic female carriers of dystrophinopathy. We reviewed the clinical, pathological and genetic features of twenty-four symptomatic carriers covering a wide spectrum of clinical phenotypes. DMD gene analysis was performed using MLPA and whole gene sequencing in blood DNA and muscle cDNA. Blood and muscle DNA was used for X-chromosome inactivation (XCI) analysis thought the AR methylation assay in symptomatic carriers and their female relatives, asymptomatic carriers as well as non-carrier females. Symptomatic carriers exhibited 49.2% more skewed XCI profiles than asymptomatic carriers. The extent of XCI skewing in blood tended to increase in line with the severity of muscle symptoms. Skewed XCI patterns were found in at least one first-degree female relative in 78.6% of symptomatic carrier families. No mutations altering XCI in the XIST gene promoter were found. Skewed XCI is in many cases familial inherited. The extent of XCI skewing is related to phenotype severity. However, the assessment of XCI by means of the AR methylation assay has a poor prognostic value, probably because the methylation status of the AR gene in muscle may not reflect in all cases the methylation status of the DMD gene. The dystrophinopathies are a group of X-linked muscle diseases caused by mutations in the DMD gene. Clinical phenotypes vary from asymptomatic high CK levels and cramps to severe progressive skeletal and cardiac muscle disorders such as Duchenne (DMD) and Becker (BMD) muscular dystrophies, and X-linked dilated cardiomyopathy (XLCM). About one third of patients present mental retardation. Most disease-responsible mutations are large intragenic rearrangements (exonic deletions and duplications) that account for 65 to 75% of cases, while the remaining cases are caused by single point mutations or small rearrangements[3, 4]. In most patients, the clinical outcome can be predicted according to the reading-frame rule. The majority of DMD patients carry truncating mutations while BMD patients usually carry in-frame mutations allowing the expression of semi-functional dystrophins[1, 5]. Female carriers of DMD mutations are usually asymptomatic due to the X-linked inheritance of the disease. However, symptomatic carriers can manifest a wide spectrum of clinical symptoms ranging from myalgia and cramps on exertion to severe disabling DMD-like muscle weakness[6–11]. Onset of symptoms fluctuates from early childhood to the fourth decade. The percentage of carriers with clinical abnormalities varies among the series[7, 12]. Hoogerwaard et al. found that 5% present regular myalgia and cramps without muscle weakness, 17% show mild to moderately severe muscle weakness, and 8% present dilated cardiomyopathy, showing an average onset at 33 years. Several disease-causing mechanisms have been implicated in DMD/BMD manifesting carriers. These include X-autosomal translocations disrupting the DMD gene, mutations on both DMD alleles[10, 14] and co-occurrence of DMD mutations together with other genetic abnormalities such as X-chromosome monosomy[15–17], X-chromosome uniparental disomy as well as male pseudohermaphroditism caused by a mutation in the androgen receptor gene. However, the most frequently reported mechanism to provoke symptoms in DMD carriers is skewed X-inactivation, favouring the expression of the X chromosome with the DMD mutated allele[8, 20–22]. Although some studies suggest the use of X-inactivation analysis for prognostic purposes, the results of different reports are controversial[21, 23, 24]. In this study we aimed to investigate the prognostic value of X-chromosome inactivation in a large series of dystrophinopathy affected females presenting with a wide spectrum of clinical phenotypes. We reviewed our database records of all dystrophinopathy patients. The database includes patients with a clinical history compatible with dystrophinopathy, X-linked family history of myopathy and/or a muscle biopsy showing abnormal dystrophin immunostaining. We identified 24 symptomatic carrier females referred from different centres around Spain. For the present study we included females with a confirmed DMD mutation or a muscle biopsy showing altered dystrophin staining, who manifest at least one of the following symptoms: myalgia, dilated cardiomyopathy, cognitive abnormalities or muscle weakness. We retrospectively collected data regarding clinical features, serum CK levels, cardiological studies and muscle biopsy analysis. Patients were grouped into different phenotype categories on the basis of their clinical course. Two control groups were selected for X-chromosome inactivation (XCI) studies. The first control group consisted of 40 asymptomatic female carriers who presented 28 different DMD mutations: 20 exonic deletions, 5 exonic duplications, and 3 point mutations. The second control group included 41 confirmed non-carrier females from 28 unrelated DMD/BMD families with known DMD mutations. The study was approved by the Ethical Committe of Hospital de la Santa Creu i Sant Pau (HSCSP), Barcelona. All participants gave their written informed consent. A muscle biopsy was taken in 17 of the 24 symptomatic carriers. These were processed for routine histological and histochemical techniques, and for dystrophin immunohistochemistry as described elsewhere. DNA extracted from peripheral blood underwent DMD mutational analysis using a combination of techniques. Intragenic deletions and duplications were analyzed using MLPA (P034 and P035 Salsa Kit, MRC-Holland). Point mutation detection was done by whole gene sequencing using published primers. When a muscle biopsy was available, total mRNA was extracted and purified from approximately 30 mg of muscle using RNeasy Fibrous Tissue Mini Kit (Qiagen, Hilden, Germany). Subsequently, muscle mRNA was retrotranscribed to cDNA by RT-PCR using polythymine primers (Invitrogen, Carlsbad, NM). Complete DMD cDNA was amplified and sequenced in twenty overlapping fragments using published and self-designed primers. Splicing mutations were analyzed using predictive software (Human Splice Finder and NNSPLICE). Nucleotide positions were determined according to the standard DMD reference sequence (GenBank accession number NM_004006.2). In eight families segregation analysis of the Xp21 locus was performed using microsatellite markers: 5’DYS-1, DXS1242, DXS1243, DXS206, DXS1238, DXS1237, DXS1236, DXS1235 and DXS1234. In four cases (subjects #1, #2, #18 and #19) a karyotype was performed before the DMD molecular analyses; all four cases showed a normal 46XX karyotype. Methylation of the Hpa II restriction site near a polymorphic (CAG)n repeat in the AR gene (Androgen Receptor) correlates with XCI. We used Hpa II digestion followed by QF-PCR to determine the methylation status of parental X chromosomes. Active alleles are digested while the inactive alleles are not. The ratio of undigested parental alleles gives the pattern of X-chromosome inactivation. For each sample, 500 ng of DNA were digested with Hpa II restriction endonuclease (New England Biolabs, Ipswich, MA). Digested products together with non-digested DNA were used as templates for amplification of the AR polymorphic repeat using fluorescence labelled primers. PCR fragments were run in an ABI 3500xL Genetic Analyzer (Applied Biosymtems, Foster City, CA). AR alleles were sized and quantified using Genemapper software (Applied Biosymtems, Foster City, CA). To correct preferential allele amplification, the allele ratio in Hpa II digested DNA was normalized using the ratio of non-digested DNA. Monoallelic patients for the AR repeat were reported as “non-informative”. Following previously published criteria, XCI ratios equal to or less than 80:20 were considered “random” patterns while ratios greater than 80:20 were considered “skewed” patterns. XCI studies were performed in lymphocyte DNA from 24 symptomatic carriers, 40 asymptomatic carriers and 41 non-carrier females. To detect familial XCI skewing, analyses were also performed in at least one first-degree female relative (mother, daughter or sister) in 15 of the 23 families with a symptomatic carrier. In 9 symptomatic carriers XCI analysis was also performed on muscle DNA. The expression of the non-coding gene XIST is involved in the mechanisms that determine the choice of inactive X chromosome. Mutations c.-43C > A and c.-43C > G, located in the XIST promoter region have been associated to cause XCI skewing[31, 32]. XIST minimal promoter was amplified and sequenced in order to detect XCI altering mutations using forward primer 5’ACCCATTGAAGTTGTGACTCCTGGT3’ and reverse primer 5’ACGCCATAAAGGGTGTTGGGGG3’. Statistical comparison of proportion of skewed XCI between two groups was estimated using Fisher's Exact Test. Comparison of XCI ratios between two groups was estimated using paired t test while comparison among groups was done using one-way ANOVA, followed by the Bonferroni post hoc test. P values lower than 0.05 were considered as statistically significant. From a total of 344 female carriers of DMD mutations we identified 24 (7%) patients from 23 unrelated families who presented symptoms associated with dystrophinopathy. Two cases were identified within the same family (subject #13, mother, and subject #14, daughter). Clinical features are summarized in Table 1. Clinical presentations were highly heterogeneous and included: isolated dilated cardiomyopathy (n = 2, 8.3%), isolated cognitive abnormalities (n = 3, 12.5%), myalgia without muscle weakness (n = 4, 16.7%), and mild to severe muscle weakness (n = 15, 62.5%). Patients presenting muscle weakness were grouped into three different phenotype categories: mild BMD-like (n = 7, 29%), severe BMD-like (n = 5, 21%) and DMD-like (n = 2, 8.3%). Subject #3 presented with weakness at the age of 2 years and was too young to be assigned to either DMD-like or severe BMD-like. Muscle weakness was asymmetric in 6 cases (subjects #6, #9, #10, #13, #14 and #15). Age of onset varied from 2 to 74 years (median: 17.5; mean: 21.7). The most common presenting symptom was muscle weakness (n = 14, 58.3%) followed by myalgia, cramps and/or exercise intolerance (n = 8, 33.3%). Patient #3, D/BMD-like, was too young to be assigned to either DMD-like or severe BMD-like phenotypes. DCM: dilated cardiomyopathy, MR: mental retardation. Cognitive abnormalities were found, in isolation or together with muscle weakness, in 5 cases (20.8%). These abnormalities ranged from behavioural issues to severe global developmental delay. Subject #1, who presented a severe DMD-like phenotype, showed severe cognitive impairment with comprehensive and expressive language almost absent. Subjects #5, #19 and #20 presented with learning difficulties or poor academic performance showing mild mental retardation in a WISC-IV test, while subject #18 presented poor social and communication skills but no mental retardation. In subjects #18, #19 and #20, cognitive abnormalities were the only clinical symptoms. In these subjects, other aetiologies of mental retardation such as metabolic diseases, brain malformations, chromosomal disorders or fragile X syndrome were considered. These were ruled out by hormone and metabolic profiling in blood and urine (subjects #18, #19 and #20), neuroimaging studies (subjects #19 and #20), karyotype analysis (subjects #18 and #19) and FMR1 molecular analysis (subject #19). Subject #18 presented a BMD affected brother while in subjects #19 and #20, in absence of previous family history of neuromuscular disease, elevation of CK levels or a muscle biopsy showing abnormal dystrophin expression prompted DMD molecular studies. We could not exclude that the behavioural abnormalities of subject #18 were aetiologically independent of the dystrophinopathy. However, her BMD affected brother presented mild muscle symptoms and mental retardation with autistic behaviour indicating that the behavioural issues could be related to the dystrophinopathy. Echocardiographic studies were performed in 14 cases and abnormalities were detected in three (21.4%). Severe cardiac dysfunction caused by dilated cardiomyopathy (DCM) was found in two cases (subjects #16 and #17) that did not present accompanying muscle symptoms. Onset of symptoms in these two patients was 66 and 74 years. Subject #15 showed mild non-specific echocardiographic abnormalities and a bundle branch block on EKG but no signs of cardiac failure. Muscle biopsy was performed in 17 cases. Results are summarized in Table 2 and Figure 1. 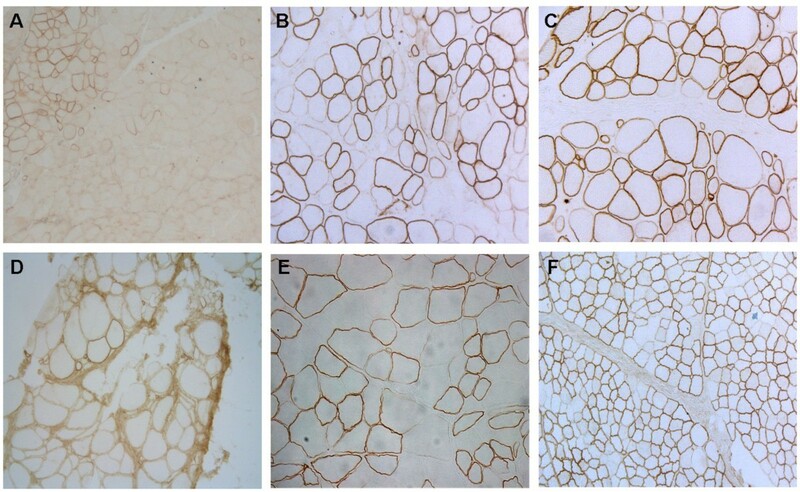 Abnormal pathological features were found in all analyzed cases, and included variation in fibre size, increased numbers of internal nuclei, muscle fibre necrosis and regeneration, and variable degree of endomysial fibro-fatty tissue proliferation. Non-specific myopathic changes were detected in four patients, whereas mild to severe dystrophic changes were found in the remaining thirteen. Immunohistochemical analysis revealed a mosaic pattern of dystrophin-positive and reduced or absent dystrophin fibres in 9 cases (53%). In 4 cases only isolated dystrophin-negative fibres were observed. Normal dystrophin staining was found in a single patient (#18) who presented behavioural issues as the only symptom. Generalized absence of dystrophin expression was observed in two patients (subjects #1 and #3), both of whom suffered from muscle weakness from early childhood. X-chromosome inactivation (XCI): skewed patterns >80:20 are in bold. n/p: not performed, n/i = non-informative AR alleles. Dystrophin immunostaining in muscle biopsy sections from representative symptomatic carriers . A) D/BMD-like subject #3, B) severe BMD-like subject #4, C) severe BMD-like subject #6, D) severe BMD-like subject #8, E) mild BMD-like subject #13, F) subject #19 presenting mild mental retardation but no muscle weakness. No association was found between dystrophin abnormalities and clinical phenotype. Among the 24 symptomatic carriers 13 had a previous family history of dystrophinopathy affected males (54.2%) while the 11 remaining cases were isolated symptomatic carriers (45.8%). The vast majority of cases with previous family history had DMD affected relatives (12/13, 92.3%). Only subject #18, who presented behavioural issues as the only clinical symptom, had a BMD affected brother. Most cases with no previous family history presented mutations predominantly associated to the DMD phenotype according to the Leiden Open Variation Database (LOVD,http://www.dmd.nl). Twenty-two different DMD mutations were identified, all in heterozygous state. These are listed in Table 2 and included: 13 exonic deletions (59%), 3 exonic duplications (14%) and 6 point mutations (27%). Point mutations consisted of two nonsense mutations, two small deletions/insertions and two splicing mutations. Subjects #2, #4, #18 and #19 presented novel mutations according to LOVD. Most patients carried predicted frameshift or nonsense mutations (87.5%, 21/24). In-frame mutations included: duplication 13–27 (subject #18), not previously described, duplication 50–55 (subject #12) and, deletion 3–13 (subject #24). The latter two mutations were both associated mainly with DMD phenotype according to LOVD. Splice site mutations were analyzed at muscle cDNA level or by predictive software in order to identify pre-mRNA splicing defects. The c.6913-1G > A mutation, identified in patients #13 and #14, a mother and daughter, destroyed the putative acceptor splice site of exon 48. At the muscle cDNA level the mutation was observed to provoke a single base deletion due to the creation of a new acceptor site at position c.6913. The c.3786 + 1G > A mutation identified in subject #4 destroyed the putative donor splice site of exon 27. Although this mutation was not analyzed at the muscle cDNA level, the presence of a cryptic donor splice site located at position c.3786 + 53 possibly provoked the retention of an intronic fragment of 52 bp. In four cases (#3, #6, #13 and #19) mutation analysis was performed both at genomic and muscle cDNA level. In subjects #6, #13 and #19, both wild-type and mutated transcripts were detected in muscle cDNA. In subject #3, only the mutated transcript carrying a nonsense mutation was detected, while at genomic level, the mutation was in heterozygous state (Figure 2). X-chromosome inactivation patterns in blood. A) Distribution of XCI patterns among non-carrier females (n = 41), asymptomatic carriers (n = 40) and symptomatic carriers excluding patients presenting only myalgia (n = 18). For each group, the five parameters are the lowest observation, lower quartile, median, upper quartile, and highest observation. B) Distribution of XCI patterns among symptomatic carriers according to clinical phenotype. Individual XCI data, mean and standard deviation are shown. The extent of XCI skewing in blood tended to increase with increasing severity of muscle symptoms. XCI analysis was performed in lymphocyte DNA of the 24 symptomatic carriers, 40 non-symptomatic carriers and 41 non-carrier females. Results are summarized in Table 2 and Figure 3. XCI studies were informative in 22 symptomatic carriers. Among these, the mean XCI ratio was 80:20 ± 16.8 and a skewed XCI pattern was found in 12 cases (54.6%). If we do not consider patients presenting myalgia as a true symptomatic carriers as previously published criteria,[10, 12], skewed XCI among symptomatic carriers (n = 18) increased to 66.7% with a mean XCI ratio of 84:16 ± 14.9. Asymptomatic carriers and non-carrier females presented similar distribution of XCI ratios: among asymptomatic carriers, 17.5% presented skewed XCI with a mean ratio of 66:34 ± 13.1, while among non-carrier females skewed XCI was found in 12.2% with a mean ratio of 66:34 ± 11.9. Differences in the XCI ratio and proportion of skewed cases between symptomatic carriers and asymptomatic carriers or non-carrier females were statistically significant (p values <0.001 by paired t-test and Fisher's Exact Test). 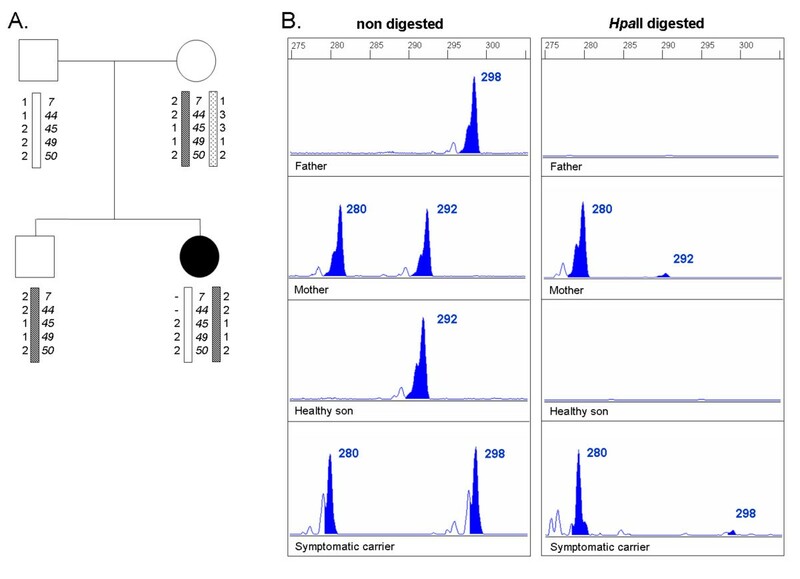 Inheritance of DMD mutation, parental origin of most inactivated X-chromosome and familial skewed XCI in family of subject #1. A) Family pedigree. Haplotype analysis of Xp21 locus indicates that the mutation is located at the paternal X-chromosome. B) Genemapper traces of non-digested and Hpa II digested AR alleles in blood. Methylated status of the AR revealed that both mother and daughter present highly skewed XCI. Maternal X-chromosome is preferentially inactivated in affected daughter indicating that the paternal X-chromosome carrying the DMD mutated allele is active. The extent of XCI skewing in blood tended to increase in line with the severity of symptoms among phenotype groups presenting skeletal muscle involvement (Figure 3B). While all patients with myalgia showed random XCI (mean ratio: 62:38), skewed XCI was present in 50% of cases presenting a mild BMD-like phenotype (mean ratio: 71:29), in 60% of patients with severe BMD-like phenotype (mean ratio: 84:16) and in all DMD-like cases (including subject #3, mean ratio: 98:2). However, these differences only reached statistical significance between DMD-like and myalgia groups. Skewed XCI was present in 80% of cases showing cognitive abnormalities (mean ratio 90:10). One of the two patients who presented a DCM showed a random pattern and the other showed a highly skewed pattern (mean ratio 81:19). XCI analysis was also performed in muscle DNA in nine symptomatic carriers (Table 2). Similar XCI ratios between blood and muscle were found only in two cases, while the remaining seven exhibited significant differences. From the seven cases showing skewed XCI in blood only three presented a skewed pattern in muscle (43%). In all cases the most active X-chromosome was the same in blood and muscle. The parental origin of X chromosomes was determined by comparing AR alleles in the patient with those of her parents, while inheritance of DMD mutation was established either by carrier status of patient’s mother and/or by segregation analysis of Xp21 locus using polymorphic microsatellites (Table 2 and Figure 4). In most cases, most inactivated X chromosome was from paternal origin (8/11, 73%) while DMD mutation was inherited from the mother (10/11, 91%). In 7 of 8 cases, mutant DMD allele segregated with the most unmethylated AR allele (active X-chromosome). However, two of them did not reach a skewed XCI pattern (>80:20) in blood. Preferential expression of the DMD mutated allele correlates with blood XCI but not with muscle XCI in subject #3. A) Automated sequence analysis of DMD gene exon 8 showing the nonsense mutation c.724C > T/p.Gln242X in heterozygous state. B) At muscle cDNA level, only the mutated transcript was detected. C) Genemapper traces of non-digested and Hpa II digested AR alleles in blood and muscle. Blood DNA presented a skewed XCI pattern of 100:0 while muscle DNA exhibited a random pattern of 61:39. XCI studies in at least one first degree female relative (mother, daughter or sister) were performed in 15 of the 23 different families with symptomatic carriers (Figure 4). Evidence of familial skewed XCI was found in eleven of fourteen families with informative AR alleles (78.6%). Surprisingly, mothers of three symptomatic carriers showing random XCI in blood (subjects #5, #6 and #21) exhibited skewed XCI. The promoter region of XIST non-coding gene was screened in all symptomatic carriers but no mutations were detected. We report the largest series of DMD symptomatic carriers, consisting of 24 cases covering a wide spectrum of clinical phenotypes. The main mechanism found to provoke symptoms in these patients was skewed XCI favouring expression of the DMD-mutated allele. We provide data consistent with the hypothesis that the extent of XCI skewing is related to phenotype severity and that skewed XCI patterns are in most cases familial inherited. We also describe what is, to our knowledge, the first report of DMD female carriers presenting cognitive impairment but no muscle weakness, broadening the clinical phenotypes associated with dystrophinopathy. In line with previous reports, isolated symptomatic carriers were relatively frequent, suggesting that dystrophinopathy should always be considered in females suffering from a myopathy of unknown cause, even in the absence of an X-linked family history. In these cases dystrophin immunostaining on muscle sections remains the best diagnostic tool even though an exon copy number screening technique (such as MLPA) can be considered prior to muscle biopsy. Muscle biopsies showed variable pathological features in all studied cases. Furthermore, dystrophin abnormalities were found in all but one case. In accordance with previous publications[6, 20, 34], we did not find a correlation between dystrophin expression and clinical phenotype, although the most affected subjects showed generalized dystrophin absence (Figure 1). Our findings confirm that symptomatic carriers present a wide clinical variability ranging from nearly asymptomatic forms to disabling DMD-like phenotypes. The progression of muscle weakness among symptomatic carriers correlates with onset of symptoms. Onset during the first decade was associated in all cases with rapid progression leading to severe phenotypes (DMD-like or severe BMD-like), while later onset, from the third decade onwards, was associated with mild progression. However, patients presenting onset of symptoms during the second decade exhibited variable severity. Subject #7 presented onset of weakness at 20 years with rapid progression leading to wheelchair support five years later, whereas subject #11 who manifested the first symptoms at 18 years is still able to walk at the age of 49 years. In accordance with previous observations[10, 12, 33], muscle weakness was asymmetric in 40% of our patients. Asymmetry may be caused by somatic mosaicism or reflect different XCI patterns between different muscle groups and tissues. In keeping with the later hypothesis, most of our cases presenting muscle weakness and random XCI in blood showed asymmetric distribution of weakness (4/5). Five patients presented symptoms without skeletal muscle involvement: two subjects presented isolated dilated cardiomyopathy while three showed cognitive abnormalities. Cognitive abnormalities, observed in five patients in isolation or together with muscle weakness, ranged from behavioural issues to severe global developmental delay. Risk of cognitive deficits among DMD patients is thought to be the result of the cumulative loss of dystrophin isoforms in the central nervous system during development. According to this hypothesis, mutations in three subjects (#5, #19 and #20) were predicted to destroy most dystrophin isoforms. Nevertheless, in the other two subjects (subjects #1 and #18) only long isoforms were predicted to be affected. It is of particular note that four of the five cases presenting cognitive deficits showed highly skewed XCI patterns in blood independently of muscle symptoms. This could indicate that the central nervous system is more affected than muscle by reduced dystrophin expression due to biased XCI. Skewed XCI favouring expression of the DMD-mutated X chromosome has been proposed as the main mechanism accounting for symptoms in symptomatic carriers without chromosomal rearrangements. However, results concerning the use of XCI as a prognostic marker are controversial. While some studies found that the great majority of symptomatic cases exhibited skewed profiles[20–22] others found that XCI is not a reliable measure to predict whether carrier female will develop symptoms[6, 10, 24]. Most women in the normal population present a random XCI pattern in peripheral blood. However, a skewed pattern is present in 8.8% of females, increasing up to 14.2% in adult women. We found a distribution of XCI ratios in blood among control groups (asymptomatic carriers and non-carrier females) similar to those described in the normal adult population. Regarding our group of symptomatic carriers, excluding those manifesting only myalgia, the number of skewed cases was 49.2% higher (mean XCI ratio 18% higher) than in asymptomatic carriers. In cases presenting skeletal muscle involvement, the extent of XCI skewing in blood tended to increase in line with the severity of symptoms (Figure 3B). However, assessing XCI through the AR methylation assay seems to have a poor prognostic value, since some subjects showing similar XCI patterns exhibited different phenotype severity. Furthermore, four subjects (#16, #18, #19 and #20) with highly skewed patterns presented no skeletal muscle involvement. When XCI analysis was performed on muscle DNA we observed no correlation between the extent of XCI skewing and clinical severity or proportion of dystrophin-negative fibres. As previously described[6, 23], in most cases XCI profile in muscle differed significantly from that found in blood. This could reflect a biochemical and genetic normalization process in skeletal muscle[25, 37, 38], or tissue-specific differences in XCI or in the methylation status of the AR gene. In keeping with the latter hypothesis, in subject #3 the preferential expression of the DMD mutated allele correlated with the XCI ratio in blood but not with that in muscle (Figure 2). This case suggests that the methylation status of the AR gene in muscle may not reflect in all cases that of the DMD gene. Soltanzadeh et al. found that DMD deletions or duplications were significantly more associated with skewed XCI compared with point mutations suggesting a correlation between XCI and mutation class. Analysing our data, we found that skewed XCI was more frequent in patients with point mutations (5/7, 71.4%) compared with those carrying deletions or duplications (7/15, 46.7%). However, these differences do not reach statistical significance in a Fisher’s Exact Test suggesting that the DMD mutation class is not involved in the development of X inactivation skewness. We found evidence of familial XCI skewing in 78.6% of analyzed families suggesting that in many cases this may be under genetic control. X inactivation is a complex process restricted to early embryogenesis in which an X chromosome is silenced at random depending on the stable expression of the cis-acting XIST gene. Skewed X inactivation may be caused primarily by preferential silencing of one specific X chromosome due to genetic factors, or by chance due to the very limited number of precursor cells present at the moment of inactivation. In X chromosome defects, skewing can also be secondary during development due to post-inactivation selection. Selection tends to preserve gene dosage: in balanced X:autosome translocations the normal X is generally inactivated while in X deletions the inactivated chromosome is the deleted X. Mutations in the XIST gene promoter have been reported to cause primary non-random X-chromosome inactivation[31, 32]. We analyzed the XIST promoter in all patients but no changes were detected. Other loci on the X chromosome have been associated with familial skewing of X inactivation, suggesting that factors other than XIST may control the primary choice of X chromosome or be secondarily involved in cell survival[40, 41]. We consider that it could be clinically important to identify the genetic factors that alter random X inactivation in heterozygous females expressing X-linked recessive traits such as dystrophinopathy. The reduced sample size and lack of systematic case collection limit the generalizability of the results. Our results demonstrate that the extent of XCI skewing is related to phenotype severity in symptomatic female carriers of dystrophinopathy. The methylation status of the AR gene in muscle may not reflect in all cases the methylation status of the DMD gene, conferring a poor prognostic value to the AR methylation assay for the assessment of XCI. Furthermore, skewed XCI is in many cases familial inherited. The authors thank all patients and their family members for their participation in this study. We thank Carolyn Newey for her kind language assistance. This study was supported by grants from Fondo de Investigación Sanitaria (PI08/0347) and CIBER de Enfermedades Raras (U-705) initiatives of Instituto de Salud Carlos III. All the authors stated that they have no interests which might be perceived as posing a conflict or bias. JJM and PG designed the research, analyzed data and wrote the paper. JJM, MJR, EV and LGQ performed DMD molecular analysis in all the samples. AN, CP, MM, PSA, LGM, FM, MRQ, MR, JDM, JP, JC and MO performed the clinical characterization of the patients. CJM, ER, CJ, FM, AHL, EG and MO performed the pathological and immunohistochemical analyses of muscle biopsies. MB gave intellectual support. MO collaborated in the data analysis and in the writing of the paper. JJM and PG were primarily responsible for this work. All the authors read and approved the final manuscript.